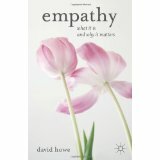 Radio Empathy is live and on the air in conversation with Dave Howe, author, Empathy: What it is and Why it Matters. Now I have written three books on empathy and they are excellent books – and everyone would benefit from engaging with them – but this book by Howe is the book I wish I had written!!! It is accessible, readable by the average reader and yet covers all the bases. Check on the conversation between Dave and myself in the radio show. You will not be disappointed. This includes but is bigger than the idea that an experience or feeling is communicated for the one person to the other. Without the other person, one loses one’s humanity. One is left without vitality, aliveness, or energy. In short, one is left depressed.